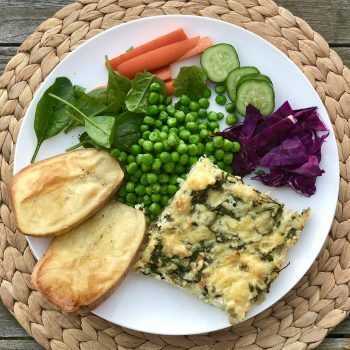 This Spinach, Feta and Rice Bake is an absolute staple in our household, as it is nutritionally balanced, quick to whip up and a definite crowd-pleaser. If we ever have some cooked rice leftover, I’ll freeze it for later, make one of these, or whip up our Spinach and Feta Slice. We like to serve it with some colourful vegetables (like chopped carrots, capsicum, avocado and cucumber), baked potato or sweet potato and some steamed greens. Often we encourage our patients to incorporate a few vegetarian meals in their diet each week, as a way to increase their fibre intake, widen their dietary variety and make sure they’re consuming as many colourful vegetables as possible. This Spinach, Feta and Rice Bake is a great meal to up your fibre intake, whilst sneaking in some delicious vegetarian protein sources as well. We hope you enjoy! *Check out our post on the best way to cook rice HERE. Preheat the oven to 200°C and grease a 25 cm round shallow baking dish (or a large rectangular baking dish). In a big bowl, combine the rice, spinach, feta, spring onions, tomatoes (if using), half of the cashews and half of the parmesan. In a separate bowl, whisk the eggs with a little salt and pepper, and then fold through the rice mixture. Spoon into the baking dish, flatten and then scatter over the remaining cashew nuts and parmesan cheese. Bake for 25 minutes until the top is golden. Serve with a big green salad or some steamed greens (broccoli, peas, bok choy, spinach etc).